Over the course of three posts, this thought experiment will lay out the problems that exist and will exist as long as utility tokens are seen as vehicles of speculation, and assert the reasons why security tokens will be the new standard for how crypto companies capitalize themselves. The first two scenarios lay out the problem that exists in crypto today given the lack of security tokens, and the potential problems that may arise down the line if crypto companies do not adopt security tokens as the standard to raise capital. The thought experiment will be easier to follow by taking an illustrative company as an example. For the purposes of this thought experiment, let’s use a made-up blockchain company with the following criteria: · Company name: HouseChain · Product: Provides short-term rentals through a decentralized network · Utility Token: HouseCoin · Security Token: HouseST Before getting into the nitty-gritty, feel free to reference my posts on utility tokens and security tokens, which may serve as quick refreshers on what these things are. Let’s dive in. Scenario 2: Role of Utility Tokens in an Environment Where Security Tokens Do Not Exist and Blockchain Companies Have Developed Products Fast-forwarding to the point when HouseChain has developed its decentralized short-term rental service, let’s analyze how purchasers of HouseCoins will use their tokens. This analysis assumes that HouseChain matured to a developed state without security tokens ever becoming the standard for raising capital (i.e., HouseChain issued HouseCoins, instead of HouseSTs, to raise capital). The above assumption implies that a HouseCoin has two potential uses: · Means for speculation · Means of trade for goods or services Crypto investors laud the theory that the value of a network increases as the network grows in user base. However, the assumption behind this statement is that users are actually “using” the network. 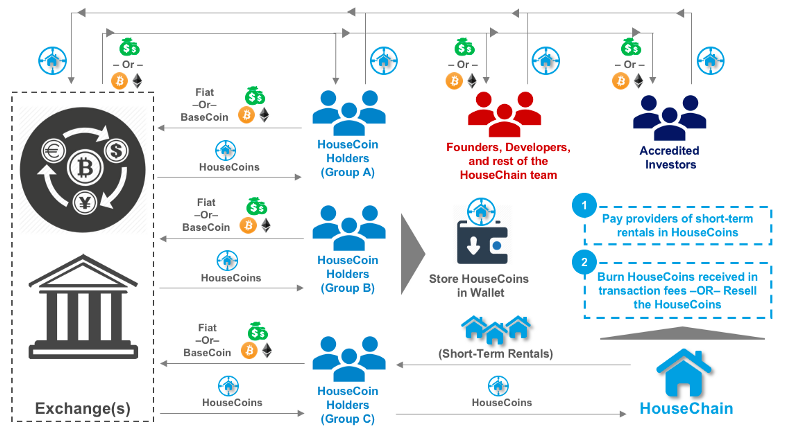 If users are speculating on HouseCoins — as is the case for Group A of HouseCoin Holders in Exhibit 2 — they will hodl and resell the tokens through an exchange at some point in the future in hopes of making a profit instead of using the token within the network. These type of holders hodl, just as HouseChain founders, developers, and early accredited investors have been doing since they first received their HouseCoins. This is because their net worth and/or the value of their investment is directly dependent on HouseCoin’s price appreciating. The end result is these holders are not using the network, and thus not contributing any value to it.